Anne Barge Spring 2018 Collection. Anne Barge is known for producing classic bridal designs with a fine attention to detail and the Spring 2018 Collection is nothing short of a beguiling, beautiful masterpiece. One glance at the names of some of these designs and you'll quickly notice that many are inspired by famous fashion icons from the 60s – Jackie O, Audrey Hepburn, Twiggy, and more. If you’re in the market for a picture-perfect and timeless creation, Anne Barge has a design for you. 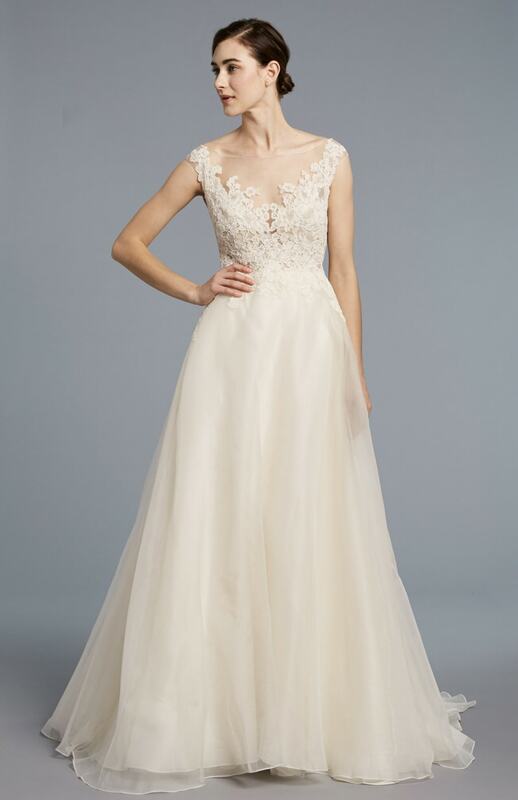 This beautiful sheath gown features a unique V-neck with lace floral embellishments. The neckline is outlined with bias bands and it's paired with a column skirt. A long sleeve classic number includes a unique floral-inspired lace neckline and bodice that gives way to a long, soft godet skirt. Glamour never looked so effortless with this design. A strapless, seamless gown features nothing more than a train and it’s perfect in its simplicity. For the brides who prefer straps, this romantic design features a sweetheart neckline, crisscross ruching on the bodice and beaded embellishments at the hips. The high waistline evokes a goddess style. A princess-style ball gown features a strapless sweetheart neckline with lots of beaded detail on the bodice. The voluminous tulle skirt adds dimension with its multiple layers of fabric. In an A-line silhouette that would be perfect for just about any bride, this floral-inspired design has plenty of detail. Floral appliques, beading, and embellishments take this dress from romantic to dramatic. Another timeless and classic creation features a sleek V-neck gown with an A-line silhouette in clean, crisp fabric. A bride can dress this look up in a variety of ways to cater to her own personal style. Barge uses an illusion bateau neckline to bring this dress to life. Soft floral appliques cover the bodice and shoulders and the silk organza skirt balances out the details. Another design inspired by florals is this strapless sweetheart style. There’s nothing complicated about this look. It’s perfect with its floral appliques on the bodice and flowing A-line skirt. For a modern spin on glamour, Barge created this off-the-shoulder style. Featuring a unique neckline, the silhouette includes a tight, mermaid-style silhouette with a dramatic pleated skirt. This floral-inspired gown features beading and appliques from the straps to the top of the skirt, which drip down to create subtle shimmer. Another illusion design features a sheer bateau neckline and stunning lace all the way to the train. The sleek sheath silhouette is flattering and elegant. One final look brings the collection full circle with its polished and glamorous design. With a modern sweetheart neckline, this gown features a sheath silhouette with an attached overskirt.